Denton’s most gentle and complete wildlife service! Denton Wildlife Removal from A All Animal Control is your local animal removal expert and we are commonly called upon to remove and control Armadillos, Bats, Birds, Beaver, Coyotes, Chipmunks, Deer, Flying Squirrels, Fox Squirrels, Skunks, Snakes, Possums, Opossums, Beavers, Fox, Geese, Gophers, Gray Squirrels, Groundhogs, Mice, Moles, Muskrat, Pigeons, Rabbits, Raccoons, Rattlesnakes, Rats, Rock Chuck, Sparrows, Starlings, Turtles, Woodchucks and Woodpeckers. Proudly serving the greater metropolitan area of Denton, TX and surrounding communities. A All Animal Control services the following area zip codes and will fully resolve your wildlife problem! If your zip code is not listed, call us and we will travel beyond our normal service area to provide you the best and most humane wildlife control services. A All Animal Control services are Tarrant, Dallas, Fort Worth and surrounding counties in Texas, TX. 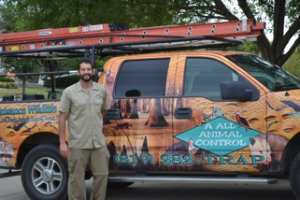 A All Animal Control, a Nuisance Wildlife Management company is a leader in providing wildlife, animal and pest control services for residential, industrial and commercial clients in Denton, TX and surrounding communities. We can handle any wildlife control problem from mice to deer and provide incredible service while using the latest technology and equipment. To control wildlife requires a qualified and experienced expert to assure you of expert care of your wildlife problem. Your wildlife expert has been specially trained in the control of wildlife specific to Denton and will take care of the problem in the most gentle and humane way possible. All wildlife experts of A All Animal Control undergo a rigorous training program for wildlife control in order to give you the most efficient and cost effective solution to your problem. Their wildlife professionals are licensed and insured for your protection and comply with all laws regarding wildlife control. A wildlife expert is just a phone call away and can often assist with your Denton, TX wildlife control needs the very same day. Call us at 817-813-9544 to put an end to that annoying wildlife problem and control damage wildlife causes. Denton squirrel and raccoon removal and control are services that we provide daily as well as bat, snake, groundhog and opossum control and removal. The use of a moth ball or other repellents often fails during the removal process and is not a legal repellant for wildlife. We often find moth balls in the attic or crawl space in use to cover a dead animal odor or smell and the owner is trying to use them as an animal remover product. Dead animal removal and odor control are services we offer for such unpleasant situations in addition to animal exterminating. Raccoon, Skunk, and Squirrel removal from a crawlspace or attic is a common problem in the Denton, TX area. We can remove a Raccoon and Opossum and Possum from a crawlspace quickly and repair the damage to your crawlspace. We will also install a new crawlspace door to prevent any future problems.